Do cats bite for no reason? play aggression- this behaviour is often seen in kittens towards litter mates, toys and people. It generally does lessen with age. In some instances it may escalate in later life and become more of a problem. predatory aggression- mimics the hunting behaviour seen in wild cats. An example would be a cat catching a bird and killing it. territorial or social (status related) aggression – this type of aggression is seen in relation to different areas in the house and people may also play a factor. Often cats will have certain sleeping positions or eating places that are specific to them. The diagnosis of aggression in cats is relatively easy and often obvious to see but there are some key differences between cats and dogs. Aggression in cats is less likely to be multifactorial as in canine aggression. This means that there are often not a multitude of factors that lead to a particular behaviour as in dogs. Passive aggression plays more of a role than learnt aggression in cats. Status related aggression does not occur in all situations in cats. It is often found that one cat in a household may become dominant around food and another around the owners or special places in the house. Management of inter cat aggression is very different from managing it in dogs. Some cats may suffer from self mutilation which is a form of obsessive compulsive disorder (OCD). The cat may seem to pounce on and growl at offending body parts. This may be seen as aggressive behaviour but the behaviour appears to decrease and even disappear when the OCD is treated. OCD can be treated with a few different behaviour modification drugs, which requires a veterinary prescription. The medication may not need to be permanent but it often is required initially to break the cycle. Calming collars and pheromones available from most veterinary practices may also be beneficial in managing OCD. As with dogs, medical conditions causing pain and irritability such as arthritis in older cats, trauma or wounds, or even conditions such as hyperthyroidism need to be treated and ruled out as a source of aggression. A painful cat will obviously respond to stimulus and touching of the affected limb or body part, but this behaviour should subside as the cat’s condition is treated and improves. Pain medication obviously plays a major role in managing this type of aggression. Status related aggression and territorial aggression are most likely to start around the time of social maturity (one to three years of age) or after a dominant cat has moved into the neighbourhood. Cats are very sensitive to change, even if the change has not occurred within their household. It has been found that some cats can patrol areas as wide as 2 km radius, which means that they can be affected by many changing situations in the surrounding neighbourhood. Predatory and play aggression are more likely to be present from kitten hood and can escalate later on in life. An important aspect of managing feline aggression is diffusing passive aggressive situations. Cats in a household may have stand offs before actually attacking. It is important to try and break up a fight at this stage before it actually happens. Being aware of and being able to identify passive aggressive postures in cats is important. Cats that stare, hunch and patrol may be exhibiting such behaviour. Timid cats often seek out positions of safety in the highest possible space. They may also seek out entrances where they can detect the aggressor as soon as possible. In cats, unlike dogs, rolling onto their back is not a position of defeat and surrender. This position allows a perfect opportunity for an opponent to pounce with five sharp ends. Managing inter cat aggression is very different from dogs in that the aggressor is demoted and the loser should be granted privileges. It is important that cats are reintroduced to each other when they are calm and under control. Calm behaviour should be rewarded. Feeding both cats in sight of each other often helps to ease inter cat aggression. It is important to remove the triggers of aggression if possible. Cats who tend to fight with each other may need to be separated when there is no supervision. Not giving attention to either cat when they are together may also help ease the tension. Preventing the behaviour before it starts may also be helpful. This can be done by punishing the aggressor or attacking cat as soon as it starts displaying passive aggressive postures. Punishments may include giving attention to the cat being attacked or placing the aggressor outside or in a different room. Desensitising the cat towards objects that it shows aggression towards is achieved by exposing it to the trigger in small, controlled amounts during pleasant interactions. One can provide safe toys that the cat can vent its instinctive behaviour and energy on. Most cat territories are larger than the average garden. Cats are natural hunters and fight with any competitors. It needs to be remembered that feline aggression is a natural behaviour if it becomes undesirable or problematic it needs to be managed as it cannot be cured. Castrating a tom cat will significantly reduce the intensity of territorial aggression but cannot be used alone to manage aggression in cats. Castration removes the influence of reproductive hormones, particularly testosterone, thereby reducing aggression and undesirable behaviours such as spraying. Castrated tom cats also tend to wander less than their intact friends. 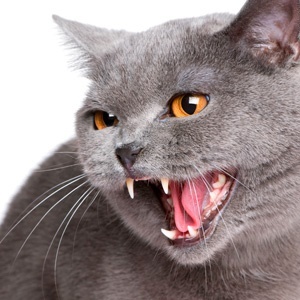 Some aggressive cats can be extremely dangerous so it is vital to seek experienced and professional advice before trying to deal with an aggressive animal, especially if one is not sure what the cause of aggression is.